Elephant on the banks of the Chobe River. Courtesy Harold Vanderschmidt. The image of the majestic elephant in the gallery above is made even more dramatic by the verdant grass running along the foreground of the photograph. It is a visual trick, accentuating the animal’s height and stance and, as the beast is staring directly at the camera, all the elements come together to add drama and energy to the entire composition. 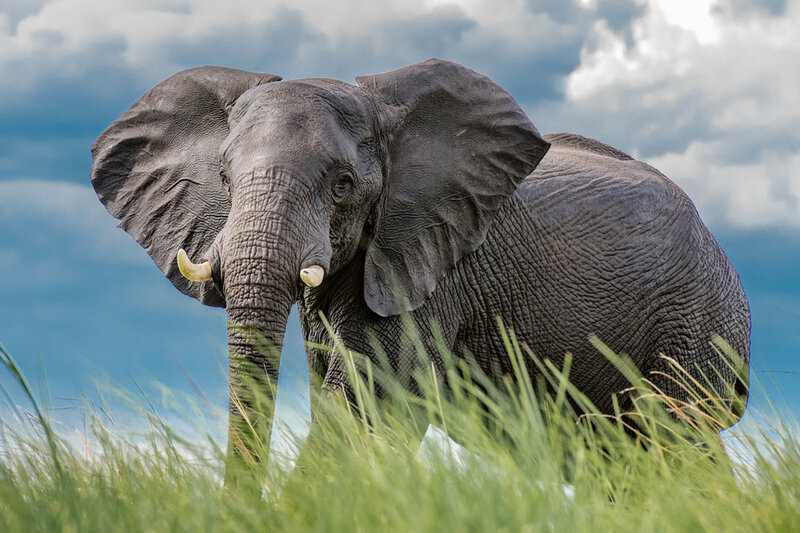 The image was taken on the border of Botswana and Namibia from a small boat on the Chobe River by Harold Vanderschmidt, a retired orthopaedic surgeon who lives in Dubai. Completely self-taught and driven by a deep-rooted passion for wild animals, Vanderschmidt, 64, has spent the past 40 years travelling the world taking wildlife snaps for his personal collection. Vanderschmidt was born in Berlin in 1955 and given his first camera at the age of six. He would go as often as he possibly could to the Berlin Zoo, spending hours watching the animals. Growing up, he was inspired by the story of Professor Bernhard Grzimek, a German zoologist who was a great advocate for saving the ­African plains of the Serengeti from the threat of agriculture. While nature photography was his all-consuming passion, it remained his hobby as he pursued medicine, in which he had a successful career. Dr Harold Vanderschmidt spent his life capturing images of African wildlife and had his first exhibition aged 64 in Dubai’s Sustainable City. Vanderschmidt moved to the UAE from Germany in 2005 and worked in orthopaedics in two of the city’s major hospitals before retiring in 2017. Occasionally, he would adorn the “boring” walls of the hospitals with some of his images, but other than that, his work has never been shown in public before. In fact, it would have remained private if it wasn’t for a chance meeting with the management team of The Sustainable City, a community in Dubai where Vanderschmidt is a resident. He was enquiring about the commercial use of the spaces in the community’s plaza on behalf of a medical team at a nearby hospital when the conversation moved on to his photography hobby. Vanderschmidt showed the team a few images on his phone and they invited him to show his work for the inauguration of ­Beitfann, the new art gallery and studio that opened with Vanderschmidt’s exhibition on Saturday, January 19, 2019. 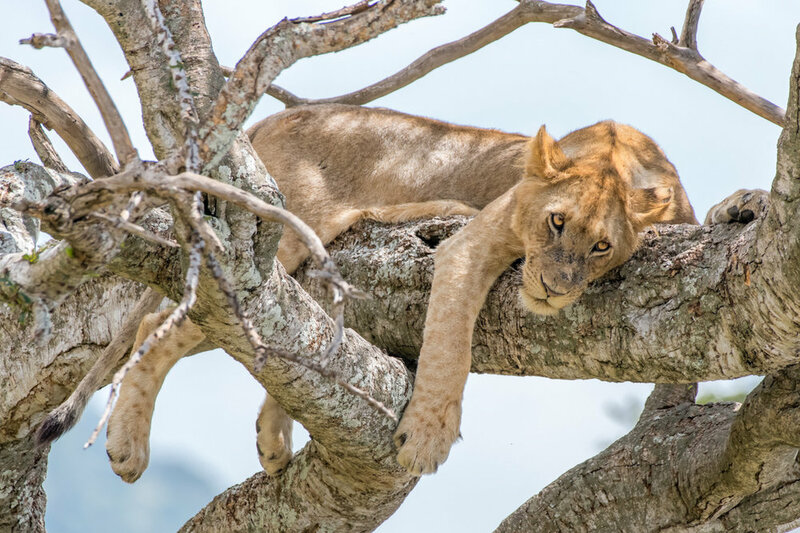 Lion sleeping in a tree in the Masai Mara Triangle. Courtesy Harold Vanderschmidt. The exhibition includes several images taken across the African continent, each capturing the beauty and character of its animals. From the elephant series there is a collection of action shots showing them playing and drinking and relaxing on the banks of the river. Some of the pictures are framed and others are printed on metal surfaces to highlight the depth of colour and light in each shot. 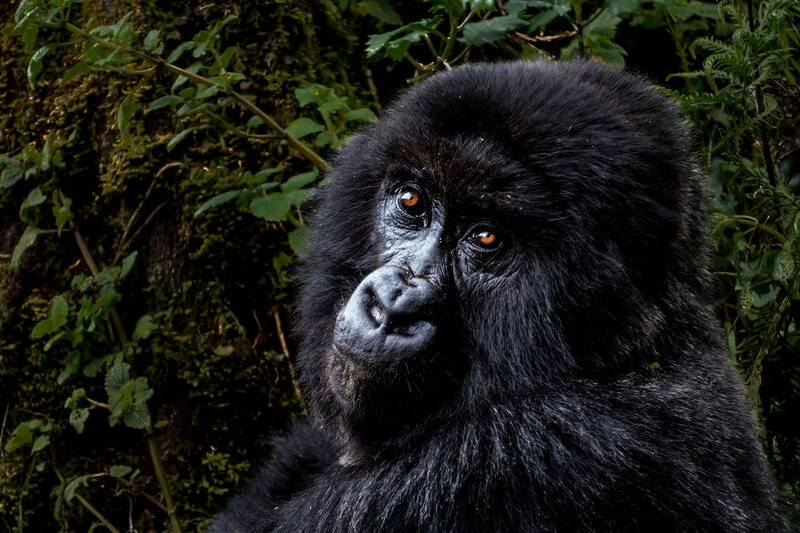 Also, several compelling images of Rwandan gorillas almost beckon the viewers towards them with their doleful, yet shining black eyes. “I walked in the footsteps of Dian Fossey [the primatologist murdered in Rwanda in 1985] while I was taking these,” recalls Vanderschmidt, who recounts several tales of adventures in the wild. An image of a herd of impala in the bush was just one of thousands he took during a one-month road trip through Namibia whilst searching for leopards, whose numbers are dwindling to critically low. Vanderschmidt’s search in Namibia was fruitless, and the several stunning leopard photographs in this exhibition came from an excursion to the Kruger National Park in South Africa. A mountain gorilla in Rwanda. Courtesy of Harold Vanderschmidt. There are lions sleeping in trees and herds of wildebeest taken in Kenya’s largest game reserve, the Maasai Mara, and a wonderful portrait of a Maasai tribesman jumping high into the air as part of a traditional dance. Another shot shows a group of scruffy African wild dog cubs, which, while not as spectacular as the “big five”, are one of the world’s most endangered species. It was critical to include them, says Vanderschmidt, to raise awareness. The exhibition is held in conjunction with the World Wildlife Fund (WWF), whose Dubai offices are also housed in The Sustainable City. In October last year, the international body released its Living Planet Report, which presents a comprehensive overview of the state of the natural world, and shows that global populations of mammals, birds, fish, reptiles and amphibians declined by 60 per cent between 1970 and 2014. It also showed that an estimated half of the world’s shallow water corals have disappeared in the past 30 years and that if nothing is done by the year 2030, the change will be irreversible. While this is a one-man show of photographs, Vanderschmidt remains optimistic about the capacity of its impact. “There is only so much one person can do, but it is important to create awareness. I have helper syndrome, meaning I want to help people – that’s why I became a doctor – and my heart is crying when I see these animals dying out. People say they are dangerous, but it is not animals who are threatening, it is humans. You can only save wildlife in today’s world when the government is involved and there are workable, economic solutions. I hope this exhibition encourages people to do what is possible to make a difference,” he says. Khalifeh concluded that alongside the exhibition, she will oversee the adjacent art studio, which will host workshops for children and help to push the message of sustainability. Wildlife Photography Exhibition by Dr Harold Vanderschmidt is at Beitfann, The Sustainable City, Dubai. January 19 - February 9, 2019.